Writers: Peter J. Hammond, David Hoskins, Steve Trafford, Michael Aitkens. This is a long-running British mystery series (12 years?) based on characters from the novels of Caroline Graham. 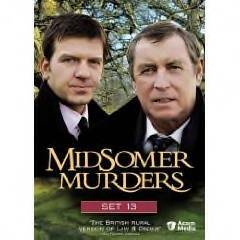 Detective Chief Inspector Tom Barnaby and Detective Sergeant Ben Jones investigate murders in the English villages of Midsomer. "Dance with the Dead" -- A young man is found dead in a vintage automobile. It appears to be suicide by ashyxiation, but where is his girlfriend who was also in the car? "The Animal Within" -- A woman arrives to meet her estranged uncle only to find him missing and that every thinks she died in a plane crash some three years ago. "King's Crystal" -- When an artisan glassworks suddenly closes and the pension fund goes missing, Barnaby must untangled the mess -- and deaths -- left behind. "The Axeman Cometh"-- A Midsomer music festival reminds Barnaby of days long ago when he was in a blues band but he must concentrate on finding a killer who is targeting the remaining members of the reuniting band, "Hired Gun." Again, these are not the strongest or best episodes in the overall series but I don't expect each episode to be great. Sadly, one must content one's self with the joy of spending time with DCI Barnaby and the rest of the regular characters including Joyce, Barnaby's wife, Cully, his daughter, and Dr. Bullard, the coroner. Oh, and let's not forget DS Jones who has picked up a bit of an attitude and seems to be becoming more like former DS Troy -- in a fun way. DS Jones has some very clever dialogue, especially in "The Axeman Cometh," which is practically all that makes that particular episode watchable, in my opinion. Still, I will continue to purchase the new sets as they become available. I do so enjoy a visit to Midsomers.